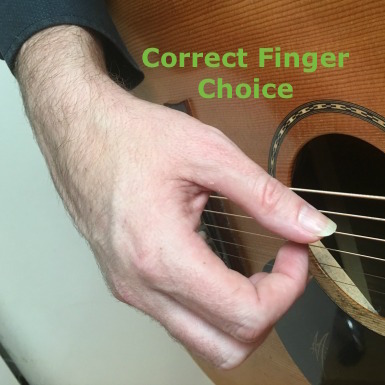 However a common problem when someone is learning how to fingerpick their guitar, is they go with what feels “easy” to them as oppose to what is “right”. Don’t do what I did, because every hour spent reinforcing bad fingerpicking technique, there is an hour needed to correct it and start building a strong foundation on which to play the stuff you want to be able to play. You might as well just go about it the right way in the first place. But what is the “right’” fingerpicking technique and how can you be sure to avoid going with what feels “easy”. Well I’m glad you asked because that is what the remainder of this article will address for you, in detail, so you can clearly define “right” from “easy” when learning how to fingerpick your acoustic guitar. 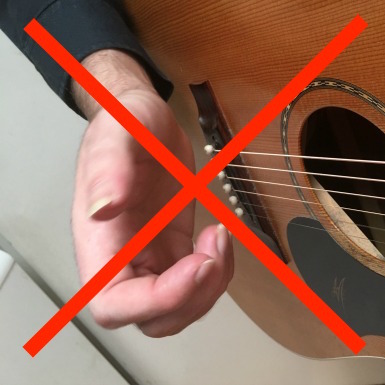 If you have fingerpicked your guitar before, even if you are quite experienced at it, I strongly suggest you still read this article. As the saying goes “you can never step into the same river twice”, meaning you are a different, more evolved player each time you revisit, refine, and improve a particular technique. Fingerpicking is no different, so let’s get to it! Lets look at the easy way to fingerpick your acoustic first. I define easy by going with what ever comes naturally to you when exploring this technique and there are 3 main problems that occur when going this route. This is a classic case of going with what feels easy. It is very unlikely that choosing whatever fingers feel comfortable to you in the beginning, just happens to be the right finger choice too. Don’t leave it to chance! Another symptom of going with what feels easy is the position of your picking hand and the angle of your fingers to the strings. 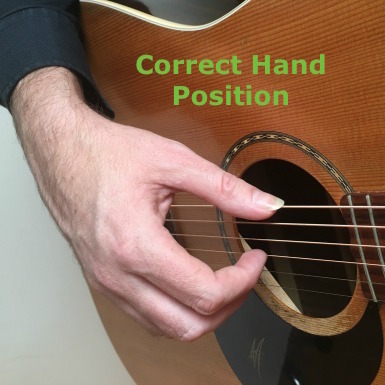 Get this wrong and it won’t even matter if you are using the correct fingers to pick your strings or not. This is because your fingers will be approaching the strings from the wrong angle, resulting in you not getting the leverage needed to pluck the string effectively. Again, this severely limits your fingerpicking technique. Think about watching someone attempt to play guitar for the first time using only one finger to fret notes. Sure it feels easier, but it certainly isn’t the right way to go about it. You need to make sure that you don’t do the equivalent with your fingerpicking technique. Well, truth be known, there actually isn’t one right way to fingerpick your guitar. If you study the playing of great fingerpickers such as Tommy Emmanuel or Martin Taylor for example, you will find differences in how they go about fingerpicking their guitars, however what will be the same are the fundamentals that create the foundation for their jaw dropping skills. Before we take a closer look at these fundamental areas of great fingerpicking technique, it’s worth mentioning that it’s recommended you have long enough fingernails on your picking hand so that when you pluck the strings they contribute to the sound. I’d say its approximately a 60/40 ratio of nail to flesh that strikes the string. You need to file your nails so they are rounded and make sure they are not too long as they will get caught under the string when plucking. Can you fingerpick without any nails? Yes, but I’d suggest you go the nail approach as you will have more control and a better tone to your sound. 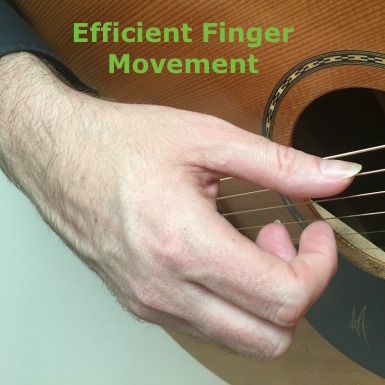 So lets look at the fundamental areas of fingerpicking by addressing the 3 main problems we outlined above, that are all symptoms of taking the easy way over the right way. 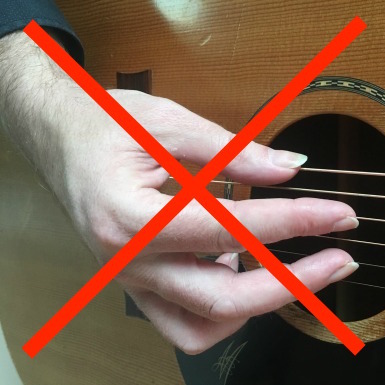 If you don’t change this when fingerpicking, then your fingers will also be at about a 45 degree angle to the strings. 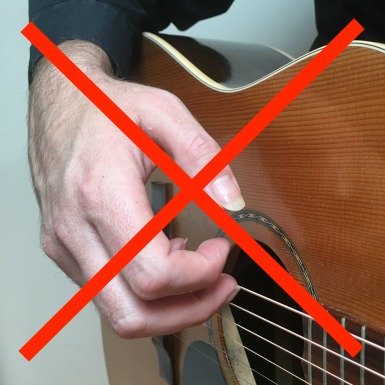 This does not allow enough leverage for your fingers to pluck the strings properly and will result in bad fingerpicking technique. Try it and you’ll see what I mean. Check out these 3 guitar fingerpicking patterns that are advanced sounding but easy to play and continue to reinforce great fingerpicking technique.